SnowTrex, one of Europe’s largest specialised tour operators for winter sport trips, has this year once again announced the most popular ski areas and accommodations in winter sports resorts and provided them with a 2018 SnowTrex-Award. This year, 69 accommodations and 56 ski areas have received the coveted award. The basis for the award is the feedback collected from previous customers each year. 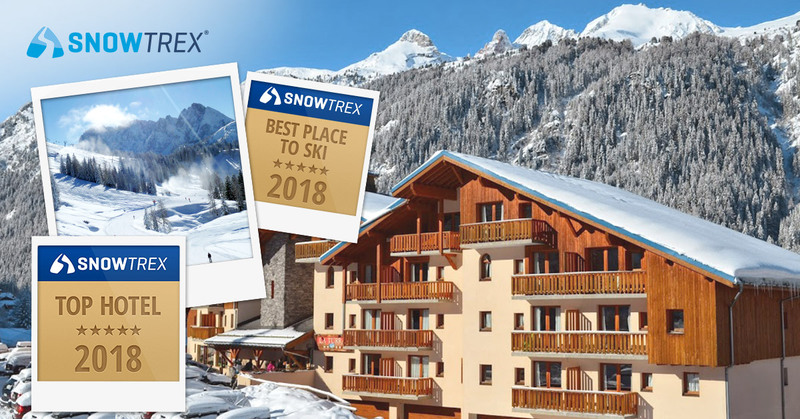 The winners of the SnowTrex-Award 2018 are available to see online and in resort, marked with either the “Best Place to Ski” or “Top Hotel” seal. When searching for the right ski area or accommodation, many winter holidaymakers base their decision on the feedback of other travellers. Is the accommodation clean? How good are the meals? Is the ski area designed for beginners? In order to help winter holidaymakers find the most fitting destination, SnowTrex asks these and further questions in a questionnaire that is sent out to all customers and in turn displays the results in detail next to each bookable holiday. Ski areas and accommodations that have especially high customer satisfaction ratings additionally receive a special SnowTrex-Award just for being nominated once again. The basis for the yearly presented SnowTrex-Award are the recommendation rates and customer ratings from the previous season referring to the service, board and facilities of the accommodation as well as the quality and extra services of the ski area, among other things. The SnowTrex-Award 2018 is presented to all accommodations and ski areas with a recommendation rate of at least 80% (accommodations) or a rating of 8 out of 10 (ski areas) and have a specific minimum number of ratings. This year, ski areas and accommodations in Austria and France are once again the leaders. The most popular destinations in Austria include the ski areas of the 3 Länder Freizeit-Arena (Tyrol, Salzburg, Bavaria), the Schladming 4-Berge-Skischaukel, the Almenwelt Lofer, the Arlberg and the Zillertal Arena, among others. In France, the ski areas of Alpe d’Huez Grand Domaine Ski, Chamrousse, Les 2 Alpes and Tignes-Val d’Isere were named winners. The other Alpine countries also have something to be proud of: For example, in Italy, the Livigno, Plan de Corones and Monte Bondone ski areas, as well as the Davos Klosters Mountains and Meiringen-Hasliberg ski areas in Switzerland and the Garmisch-Classic and Zugspitzplatt ski areas in Germany have also received the SnowTrex-Award. Accommodation winners in Austria include the Apartment Abendstein in Fügen, the Jägerhof in Kolsassberg, the Ferienhof Oblasser in Mayrhofen and the Alpenhotel Ramsauerhof in Hippach. In France, accommodation winners also include the Les Villages du Bachat in Chamrousse, Les Alpages de Val Cenis in Val Cenis, Le Hameau du Puy in SuperDévoluy as well as the Les Hauts de Valmeinier in Valmeinier. In Germany, the Hotel Binderhäusl in Berchtesgaden as well as the Hotel Vier Jahreszeiten in Garmisch-Partenkirchen also won. In Italy, favourites include the Alpen Village in Livigno and the Glacier Hotel Grawand in Kurzras, and in Switzerland, the Hotel Panorama in Hasliberg and the Résidence Le Pracondu in Nendaz.